The gold and complete joy in my practice is that moment when your completing the pot form for its final finesse…..fingertips and turning clay, moving slowly, delicately but in control. This control, this striving for perfection….is all about letting go? You can’t push it, you have to relax…..and it can takes hours, weeks, months, years to get to this point. ……..this throwing moment is pure bliss. Throwing with porcelain is, (pictured here is Lumina from Keanes) like throwing with a milkshake, smooth and thick. 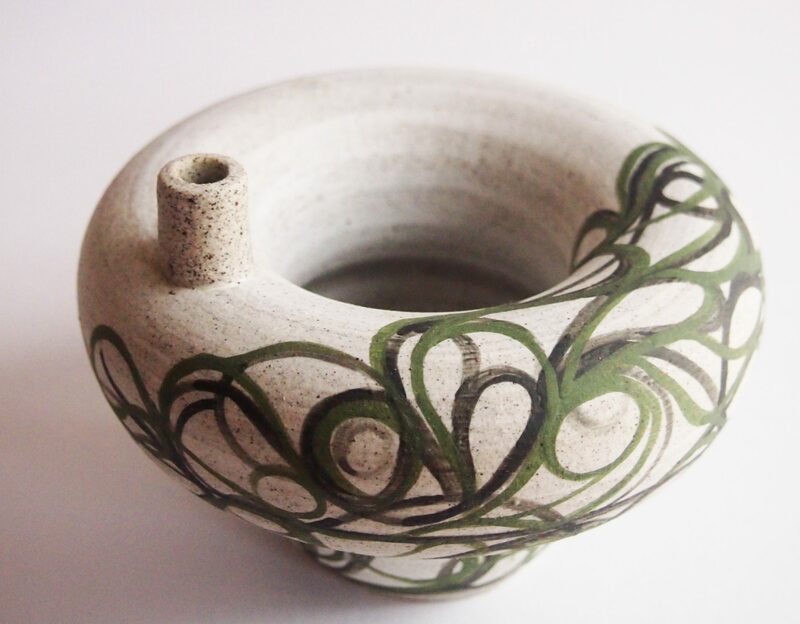 I believe the Lumina in particular has a high tolerance rate (very forgiving), a firm enough body which allows you time to create your desired pot form before the water content makes the clay collapse. Like all porcelain it does have a tendency to slump…….this is where you think you have thrown fine enough but it falls back into itself slightly, so do go over your form again after a rest….see if you can push the clay a bit further? Keep the throwing water as clean as possible from becoming slip like and don’t be afraid to use a heat gun at the final moments. Lumina fires pure white in an oxidised kiln environment, perfect for surface decoration. ……..began in the ceramics room. Fortunate for me my secondary school taught pottery and I relished the term a year I got to indulge in clay. Monash University B.A CRAFT in 1994. They offered Both Metal & Glass but Clay was for me. In 1997, I completed my honours. In 1999, A Diploma of Education and I left my professional practice behind. Forward to 2014…and the birth of my second child. I decided it was now or never and I slowly began to bridge the gap of 20 years and make friends with clay again. To now….the close of 2017 and I look back to what I have achieved in the past 3 years. I feel I have bridged the gap and are now ready to produce a cohesive, resolved body of work in 2018. This blog will be about my clay practice.